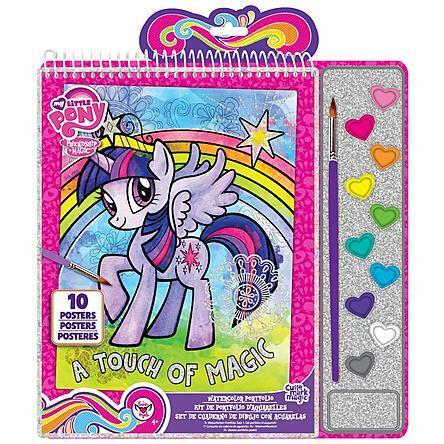 My Little Pony Sketch Portfolio Just $6.99 Down From $14.99 At Sears! You are here: Home / Great Deals / My Little Pony Sketch Portfolio Just $6.99 Down From $14.99 At Sears! Sears has this My Little Pony Sketch Portfolio on sale for $6.99 (Reg. $14.99)! Design your own custom line of ponies with the My Little Pony Sketch Portfolio. This spiral bound portfolio book includes stencils that make drawing easy for any age or skill level. Use the stencils to outline the tail, mane, cutie marks and even a few accessories for each pony. Then color in your designs with the markers included with this portfolio. Use the design guide for inspiration and ideas on how to make each design super fabulous. Finish your designs by embellishing them with the stickers included with this set. The My Little Pony Sketch Portfolio includes with spiral bound portfolio book with 30 sketch pages featuring 5 rotating pre-formatted page designs, 3 removable stencil sheets, 6 mini markers, 1 sheet of foil stickers and a design guide.